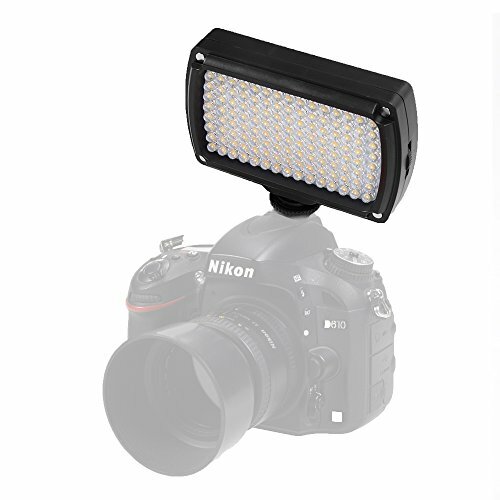 This LED Dimmable Ultra light helps to ensure perfect settings for your photography or video subject. With it's lightweight and durable construction, you can carry this light around with you wherever you go. Features 96 super-bright Photography studio LED lights and is equipped with a dimmer switch so you can adjust the intensity while shooting. The layout allows for quick, easy adjustments to be made so you never miss that perfect shot! It can mount to any standard hot shoe on most DSLR or digital video cameras as well as tripods and light stands Power Panel Digital Camera light is also equipped with a pivoting head, allowing you to raise or lower the light's angle. LED Video Light is easy to install and use and will make a great addition to your photography or video studio. Two soft diffusers, white, yellow. ▶LED Video Light is easy to install and use and will make a great addition to your photography or video studio. ▶The camera video light helps to ensure perfect settings for your photography or video subject.It was a lifesaver in a low light wedding event.This dslr led light is so bright, you can used it as a fill light in various lighting situations. ▶Low power consumption, eco-friendly & power saving. Lightweight, portable and compact,you can carry this camcorder video light around with you wherever you go.The layout allows for quick, easy adjustments to be made so you never miss that perfect shot! ▶Features 96 super-bright LED photo lights and is equipped with a dimmer switch so you can adjust the intensity while shooting.Easy to change the amount of light when you get to fit any situation. ▶The led digital light very useful is the two filters，The one is the yellow filter that give you warm light.the other one is white filter that give you cool light.The filters fit snugly and stay in even if you turn the light upside down.